Life is busy and hectic, most of all for busy executives chasing targets and deadlines, rushing from place to place, running against time, getting stuck in traffic, making presentations, doing client calls, or just researching the market mood. This is made worse during summer by the searing sun. While you can't wish away the heat, or stop stepping out, you can definitely prevent it from striking hard. 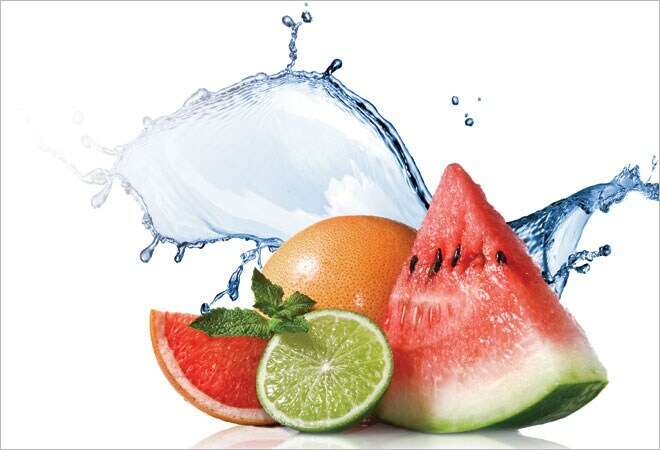 Two 'big' tenets of hot months' eating are: staying hydrated and replenishing electrolytes regularly. That's because as temperatures soar, our body loses these way too fast leading to dehydration and heat stroke, which often manifests itself as lethargy, irritability, flushed skin, muscle weakness and cramps, throbbing headaches, rapid heart beat and nausea. Here's my pick of five refreshing ways to stay hydrated and happy all through summer. Make sure you are drinking 7-8 glasses of water every day, and never go out in the heat without having a glass of water. Matke ka pani is a good idea as soil has magnetic power and helps remove the impurities, besides keeping the water cool and at a pleasant temperature. Have 300-350 gm of watermelon every day, ideally right in the morning before you step out for the day. This completely waterlogged red, juicy fruit rehydrates effectively (it's 90 per cent water) and provides relief from the scorching heat. Plus it has impressive concentrations of phenolic antioxidants, flavonoids, lycopene, and vitamin C, and is loaded with potassium too, which helps keep your blood pressure in check. Add to that the fact that it's extremely light on the palate and stomach and you have a summer winner. It also fills you up without taxing digestion, or making one feel sluggish. If you can't stomach plain fruit, purÃ©e the watermelon, add a dollop of yoghurt and you have a refreshing cold soup. You can also mix it with thinly-sliced red onion, salt and black pepper to make a great summer salad. Bet you didn't know that green moong sprouts are a cooling food. Try a potato chaat mixed with a handful of sprouts and a few slices of cucumber for the perfect summer snack. Also try this super easy trick: make cucumber sticks, sprinkle with salt and pepper, refrigerate them and munch on them all day long without worrying about calorie surplus. You can also make fresh vegetable juice using a combination of celery, lettuce, tomato, apple, and anything else that looks good in the veggie bin. Dab a bit of hot sauce or juice of a tiny jalapeÃ±o to boost the taste quotient. To help beat that run-down feeling, take 3-4 pieces of dates and boil them with one glass of milk or water. Eat the dates and drink the milk or water as this gives instant energy and hydrates too. Feeling wiped out in late summer afternoon? Skip your mandatory tea or coffee, give aerated drinks and iced tea a miss (all these dehydrate further), and instead, dig into a cup of yoghurt, paired with a fruit. The combination of protein, carbohydrate, some fat and loads of electrolytes (via the fruit) will revive you and give your brain a boost too. Traditional cooling drinks are still your best bet to keep your body temperature down. Add barley (powdered) to water with a little lime, rock salt, and roasted cumin powder for a cool drink. Have jaljeera with lots of mint in it as it contains good quality iron and not only helps beat the heat it also provides protection against infections. Bael fruit juice also works well. Cut from the middle, scoop the bulk and add to water. Strain, chill and serve after an hour. Infections are usually rampant in summer and immunity is at an all time low. Keep an antidote ready by incorporating fermented foods in your daily diet. These are easy to digest, are teeming with enhanced micronutrients, and also restore the proper balance of bacteria in the gut. Chaach (beat yoghurt, add water, add black salt and roasted cumin or jaggery) twice a day is the best way to fix this. If you mix in some sattu powder to this concoction, its cooling quotient gets boosted further. Want to give it an exotic twist? Have mango/ lychee or jamun lassi. No need to add any sugar, just a pinch of salt works well.